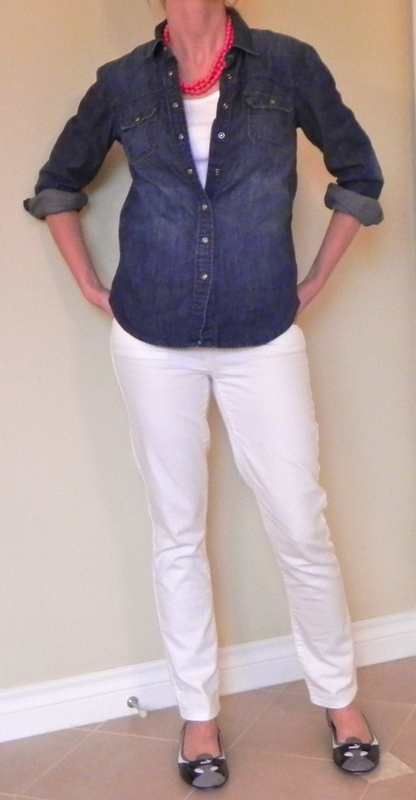 I like this casual- perfect for running errands or attending weekend sporting events- type outfit. I’m wearing my black skinny pants (these are not leggings- these are actually pants) worn layered over a black tank, then a denim shirt, then a black puffy vest. It’s warm, comfy, and sort of stylish! 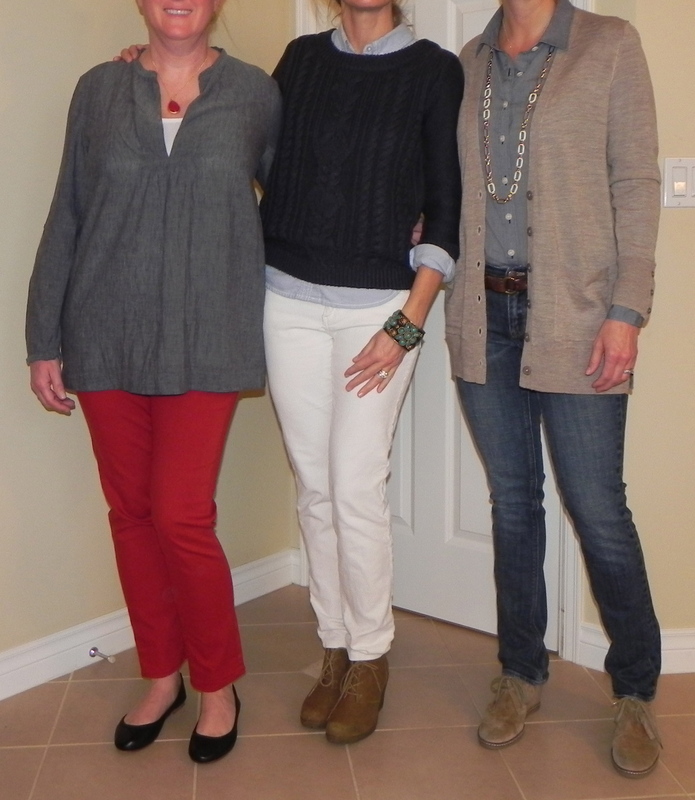 On the right, I’m showing a before picture of how not to wear denim! While I love the denim on denim look- this is too much! This is such an easy outfit! It’s another gorgeous day here in the Pacific Northwest! We are having the best summer/ fall I can remember (according to my friend who runs the local farmer’s market, we are on 20 weeks straight of sunshine)! Thank you Mother Nature! 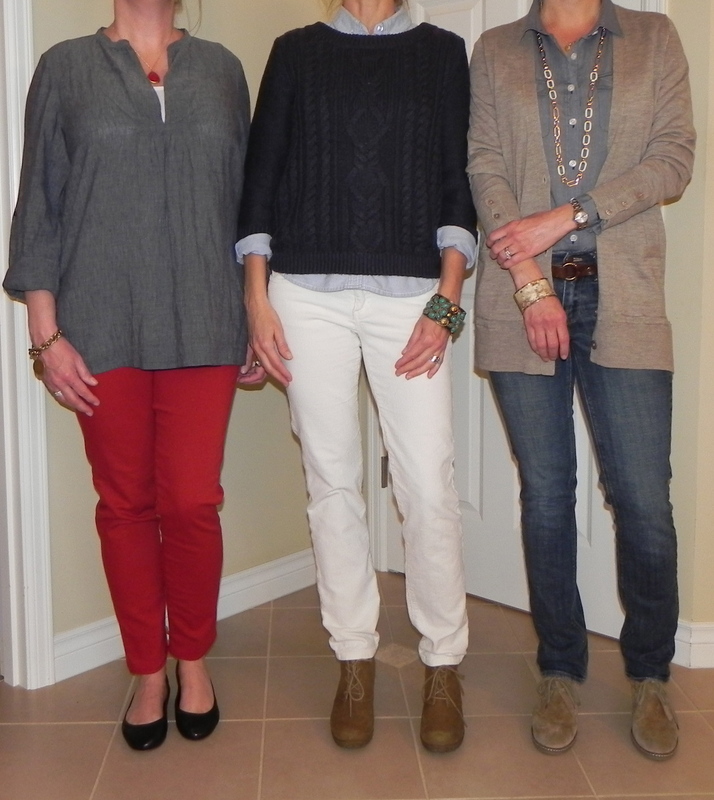 I’m wearing one of my favorite fall looks today- cropped jeans, ballet flats and a cozy wool sweater. It’s a good outfit for running errands, attending soccer games, going out to lunch… whatever the day has in store for you! I know I’ve shown this before pic already- but I think it does a good job of showing how easy it is to change small details- and yet have a much better look. The new wash is a bit more beat up with subtle whiskering and a slight blue-grey cast. Strategic hand sanding is slightly darker on the sides to create a longer, leaner look. This denim is a nice weight with a touch of spandex for great recovery. On top is a camel wool sweater layered over a denim shirt (yes, you can do denim on denim- I swear). One of the things I love about this sweater is the back (hence the picture of me from behind!). It’s a small detail, but I think it adds interest to the look (not to mention a few comments of “did you know you have your sweater on backwards?”. As for my shoes- these ballet flats match the color of the sweater- tying the whole outfit together. And of course, a necklace finishes the look. No it’s not on backwards, I swear! In my opinion, there is something very cool about denim on denim, I just love it! The important thing to keep in mind when wearing it is to make sure you have two totally different shades of blue. As you can see on the right- the top and jeans are too similar and it looks awful. To make matters worse, these jeans are too long (see how they puddle around my ankles) and then the tennis shoes complete the look of awfulness (is that a word?). On the left I have replaced the poor fitting jeans with my skinnys and replaced the tennis shoes with these cute ballet flats by Frye. I like the neutral colored shoe with this outfit. And, as opposed to the dark blue on the right, this denim shirt is a nice light blue, contrasting perfect with the dark jeans. I’ve unbuttoned it a few buttons, rolled the sleeves and added a tank- (remember my rule of 3? Shirt, tank, necklace)! Just for fun, I added a little touch of color with this pink necklace. This outfit is inspired by an ad on TV for Marshalls, maybe you’ve seen it? A stylish gal drives a bus into a neighborhood and all of a sudden a fashion show erupts. One of the models is wearing a striped dress with a denim shirt underneath- and I thought- OMG! I have a striped dress AND I have a denim shirt. I’ve shown this dress several times- it’s one of my favorites, but alone- it is shapeless (as seen on the right!). On the left is my re-worked look. I’ve added the denim shirt under the dress, then added a belt to define my waist. As usual, I’ve added a necklace to add some interest. Finally, I’ve chosen my tan ballet flats to finish it off. I would have NEVER tried a shirt under a dress, thank you Marshalls for inspiring me! I really like this look! I’ve slipped to #13 on Top Mommy Blogs! Please take a second to vote (it’s so easy, just one quick click on the button on the top right of this page). Thank you so much!! 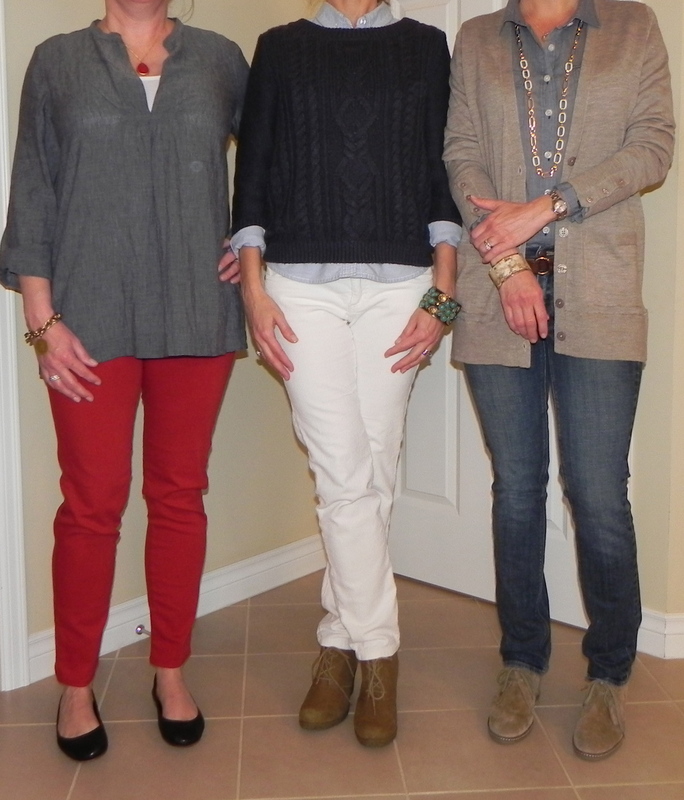 Linking up with Momtrends for Monday Mingle. I love it when I come across a fabulous outfit on Pinterest and I actually have the clothes to copy it. Actually, I don’t call it copying, I call it ‘being inspired’ because isn’t that what fashion is all about? Seeing something you love and then making it your own? Today’s outfit comes from Tandsdaybook.blogspot.com via Pinterest. 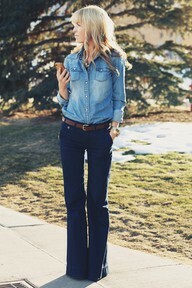 I just love this look of denim on denim, it looks effortlessly cool and chic. However, no matter how hard I try, she still seems so much more glamourous than me. Maybe it’s her hair? As per usual, I just had to show you how even denim on denim can really go wrong. Below you will see an attempt that shouldn’t need any explanation! But I’ll tell you anyway… the denims are too similar, and by leaving the shirt untucked, it’s just a solid mass of blue. I also have the shirt buttoned up way to high, making it look matronly. Finally, the square toe boots are outdated and add nothing (as opposed to the pointy toe snakeskin heels worn above). By the way, thanks for all the votes- we are now in the top 10!! Yipee! Please keep voting, just 1 small click on either the banner below, or the one at the top right! Thank you so much! This version of denim on denim is anything but cool! Greetings from sunny southern Cal (which is a real treat considering the sun is a rarity during the winter in Seattle.) I’m heading to the local street market today, so I wanted something that is super comfy, yet stylish. I’ve chosen white jeans and a denim shirt. On the right I have on my old white jeans. With the bootleg style, they look a little dated and frumpy. My buttoned up denim shirt isn’t helping much either. On the left I’ve switched out the old jeans for these cute toothpick ones from J Crew. I’ve also added a tank under my denim shirt, and rolled the sleeves up to give it a casual vibe. To add some color I’m wearing my new favorite necklace- which gives the whole outfit a focal point. Well, my search is finally over- I think I have found the perfect shoe. Introducing the Puma slip on. They are sneakers that look like ballet flats. I’m serious, rush to Nordstroms right now and get yourself some before they sell out. 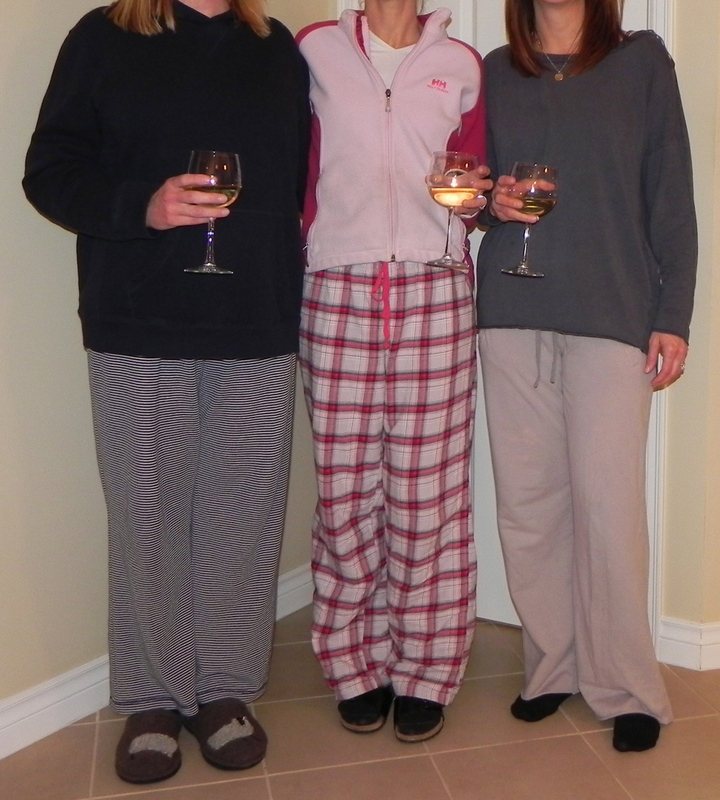 They are sublimely comfy and stylish- what more can an everyday mom want? These shoes are absolutely perfect for me- comfy and stylish! Please don’t forget to vote for me for Top Mommy Blogs- it’s so easy, just a tiny little click on the right (where it says Vote for Us). That’s it! You can vote everyday (I hope you do!). Thank you!! !